I am really loving these cake spatulas I've pretty much bake a lot and I also make all the birthday cakes or cupcakes in my family. This is a great addition to all my baking tools I have this is going to help me out with frosting to make it look more like fondant. 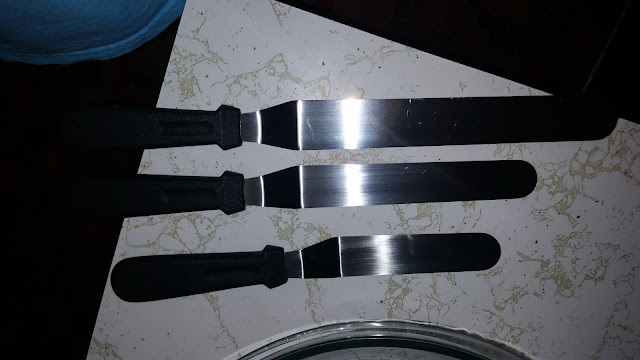 These spatulas are really nice because they have small, med, and large so weather your doing a single cake or 2 layer or maybe a five layer their is a spatula for each. I am glad i can add this to my baking supplies. And they are made really well. The handles are also really nice and made from a light weight plastic. The blade sizes are 6,8, and 10 they are dishwasher safe but also really easy to clean in the sink also. Perfect for cupcakes too which i love to make. So if your looking for some good icing spatulas these are it.